Welcome to my little slice of the bookish community. 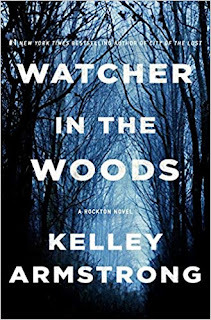 I am here today to tell you about Watcher In The Woods, by Kelley Armstrong book FOUR in the Rockton, Casey Duncan Novels. When a US Marshal shows up demanding the release of one of the residents, but won't say who, Casey and her boyfriend, Sheriff Eric Dalton, are skeptical. And yet only hours later, the marshal is shot dead and the only possible suspects are the townspeople and Casey's estranged sister, smuggled into town to help with a medical emergency. It's up to Casey to figure out who murdered the marshal, and why someone would kill to keep him quiet―before the killer strikes again. Murder & Mayhem in a small town! Straight away, Again I was emerged in this town. Kelley has me pulled in and so hooked, I am obsessed! As we know Rockton is this isolated very off the grid town, some where in the wilderness of Canada. Where victims can hide, and create a new life for themselves. A new star at life. The only thing is, it has a council of douches and they have there own ulterior motive. In this new instalment, there are so many twist and turns you were constantly on the edge of your chair gasping with breath thinking wtf is happening who is actually who they say they are, and why so many secrets. We find out someone in town is more dangerous than what that thought. This person brings an unexpected guest of a US Marshall into Rockton looking for his bounty. I can not tell you any of that, because this was truly one book that the plot over all thickens. I love this town,k the characters and the way the author captivates you and wont let you finish until you read the last word. I listened to this one in audio, and again the narrator is fantastic. I highly recommend the in audio. I can see myself re reading these in time and time again, i can not wait to see what happens next in this series. Casey and Eric are in for a wild ride, with not so many deaths, but with lots of twists and turns. We get to meet Casey's sister April, who comes to the town of Rockton as a Dr to help Kenny. but in the end she ends up staying and not visiting. i am so excited to see what happens there. One character who I missed truly, was Jacob. we did not see him hardly at all. That is because they were not really out in the woods a lot but more in town and down south. Watcher In The Woods, takes place straight after the events of the previous book. So i highly recommend them to be read in order. This isolated town, with no modern amenities is one town I wouldn't love to visit but I kind of want to. At many times my heart was in my throat, that creepy feeling is still in this book, with one crazy adventure trying to solve the crimes and unfold the councils secrets, which I think it is safe to say Casey has almost figured some of what they have done. The development with Petra, are shocking. Phil is annoying and stupid. He dose not seem as bad as Val, but I am not sure on him yet. Roy Is legit a douche, who I do not like. Sebastian, I can even with that! Matthais, I really like him. Bear bowling, shoot, I found this funny at times. I just love the comradely we have between everyone now. I have to mention the world building in this series is phenomenal, not once did i want to put it down. I really love this series, Eric and Casey are almost my number one couple.